TURBISCAN™ LAB is the market leader among the instruments which are used for accelerate and document ageing tests for a fast and deep understanding of destabilisation mechanisms (creaming, sedimentation, flocculation, coalescence). The instrument is used in both R&D labs for formulation development and QC labs to control the stability of raw materials and final products. Particle size and its evolution versus aging time are key parameters which have to be controlled. Liquid suspensions in industry are very complex mixtures as several components are dispersed and in equilibrium. 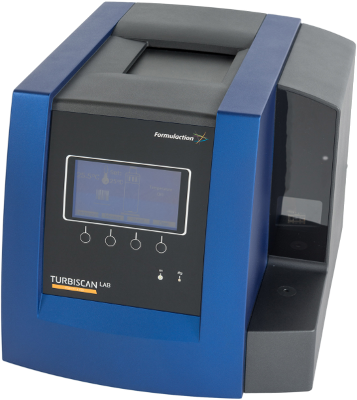 Turbiscan is a powerful tool to measure the mean particle size on concentrated media, as no dilution nor sample stress are required: the sample is analysed in its original state thanks to the Static Multiple Light Scattering. Real dispersion state, such as presence of agglomerates or flocs, can be easily identified and measured, without altering the real particle size.